Acidic soil, which is soil with a pH lower than 7 can be a problem if you intend to grow certain plants, such as vegetables, most annuals, and lawn grasses. All of these types of plants perform poorly in acidic soil because soil acidity prevents them from taking up nutrients from the soil. 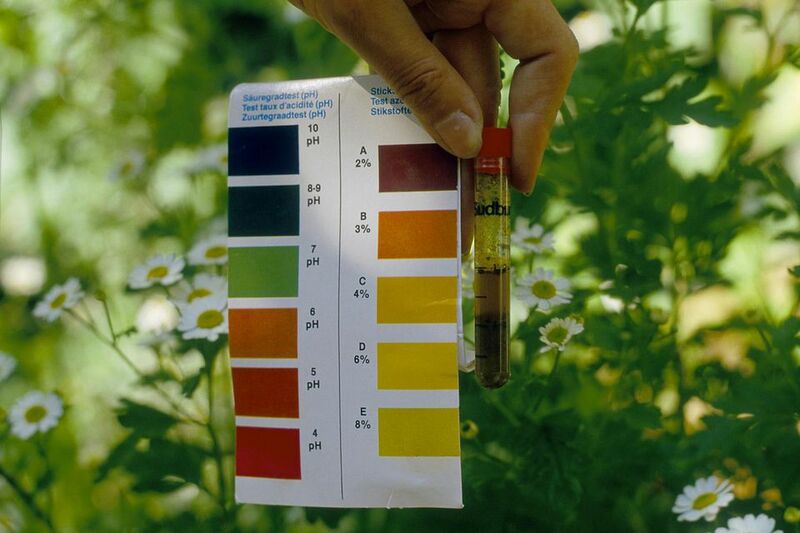 If a soil test has indicated that you have acidic soil in your garden, there are a couple of things you can do to start improving your soil and increase the pH. Adding pulverized limestone or dolomite limestone (which has magnesium in addition to the calcium carbonate that makes up regular lime) is one of the fastest ways to increase your soil's pH. You'll generally want to look for something called "garden lime" or the above-mentioned "dolomite limestone" for your garden. Other types of lime, such as hydrated lime or "quicklime" are much too caustic for garden soils, and less safe for the gardener to use. The general recommendation for adding lime to your soil is to add five to ten pounds per 100 square feet of garden soil to increase your soil's pH by one level (to go from a pH of 4 to a pH of 5, for example). If you have clay soil, it will take more than the prescribed level to raise your pH. This is a good reason to have your soil tested; the results you get back will give you exact recommendations based on your particular soil type. You may have to add lime regularly to maintain your soil's pH once you have it where you want it, so plan to perform a pH test at least once per year if you've been battling acidic soil. Bone meal, which is exactly what it sounds like, is a good source of calcium and can help raise your soil's pH over time. It is not a quick-fix method and is best used for soils that are only slightly acidic. General recommendations are to apply bone meal at a rate of five pounds per 50 square feet, but you can increase that (up to double) if you are trying to raise your soil's pH. Another long-term solution for acidic soil is to keep adding good quality compost to the area. While this won't have an immediate impact on the soil's pH, it will help improve it over time and provide any plants in the area with vital nutrients while you're getting the soil's acidity level under control. Add at least two to three inches of compost per year, either to the surface of the soil or dug into the soil, depending on what you're growing in that area. If you're growing perennials, shrubs, or trees, simply topdress the area with compost. If it's a new planting area or one that you replant every year, such as a vegetable garden, then dig it into the top few inches of soil at or before planting time, or at the end of the season. You can also use wood ashes to increase your soil's pH. If you take this route, just make sure that you haven't burned any treated woods, or black walnut, which is generally toxic to other plants. Wood ash is best applied in the fall, at a rate of about five to ten pounds per 100 square feet. If you decide to apply wood ash, be sure to dig it into the soil, otherwise, the small, dusty particles will simply blow away. Improving acidic garden soil isn't difficult, but it will take a bit of time and patience. Whether you choose lime, bonemeal, ash, or compost (or a combination of them) to help improve your soil, you'll have a healthier garden and stronger plants as a result. Where Can I Find Free Trees, Shrubs, and Flowers for a New Garden? Is Manure Safe to Use in Your Vegetable Garden?